IEEE CCNC 2015 conference has selected the Planet Hollywood Resort & Casino as its headquarters hotel. The Planet Hollywood Resort & Casino is an exciting place to be. 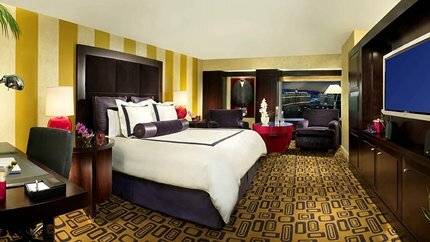 Located on the Las Vegas Strip, this Las Vegas Resort offers spacious rooms and bathrooms, as well as nearly three acres of casino entertainment. Housing for CCNC 2015 is now open! *Please note - a daily $20.00 resort fee plus tax will be added to your rate upon check-in. Reservation Deadline is Thursday, December 18, 2014. Upon booking your reservation, your credit card will be charged, a deposit equal to one night's room and tax. To avoid forfeiture of deposit, please ensure all changes and cancellations are made at least 72 hours prior to scheduled arrival date. The IEEE Communications Society has contractual obligations to fill guaranteed guest room blocks at Planet Hollywood. Significant financial penalties will be assessed the Society should CCNC 2015 fall short of the expected number of rooms guaranteed. By staying at the Planet Hollywood, you'll enjoy logistical conveniences and additional networking opportunities in valued support of IEEE ComSoc's financial obligations.